Introduction here. Software notes here. First, some photos for inspiration and reference. The case slots together from the laser cut parts, and the screws and standoffs hold it together. The four longer (31 mm) standoffs go in the four corners of the case, and the four shorter standoffs (25 mm) go in the back of the case to hold the controller PCB in place. The screws fit snugly in the laser cut holes, so take care to ease them in the first time. 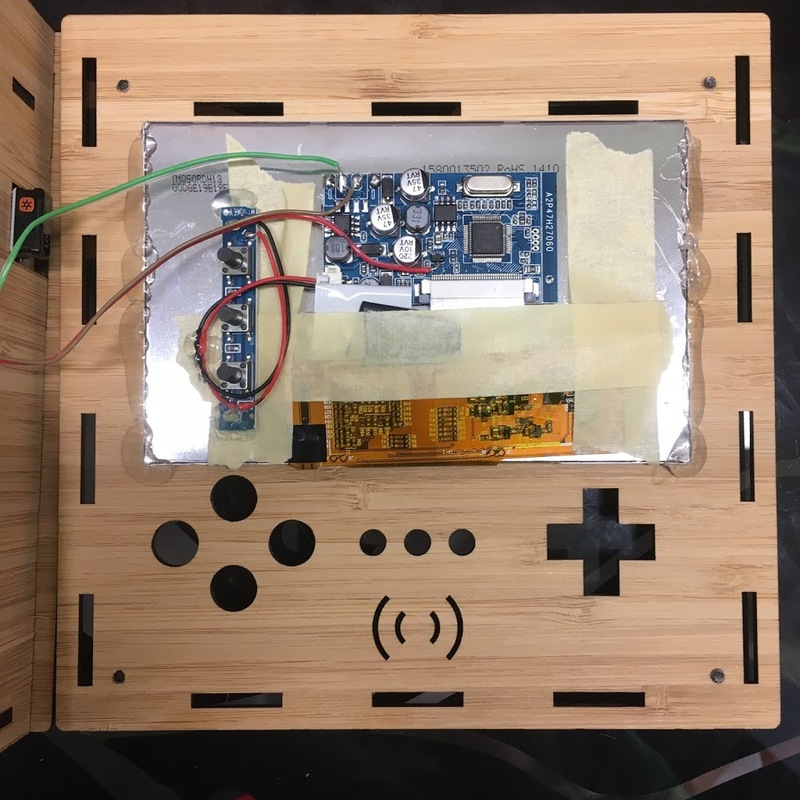 The two switches, three buttons, one potentiometer, headphone jack, and micro USB jack panel mount on the case. 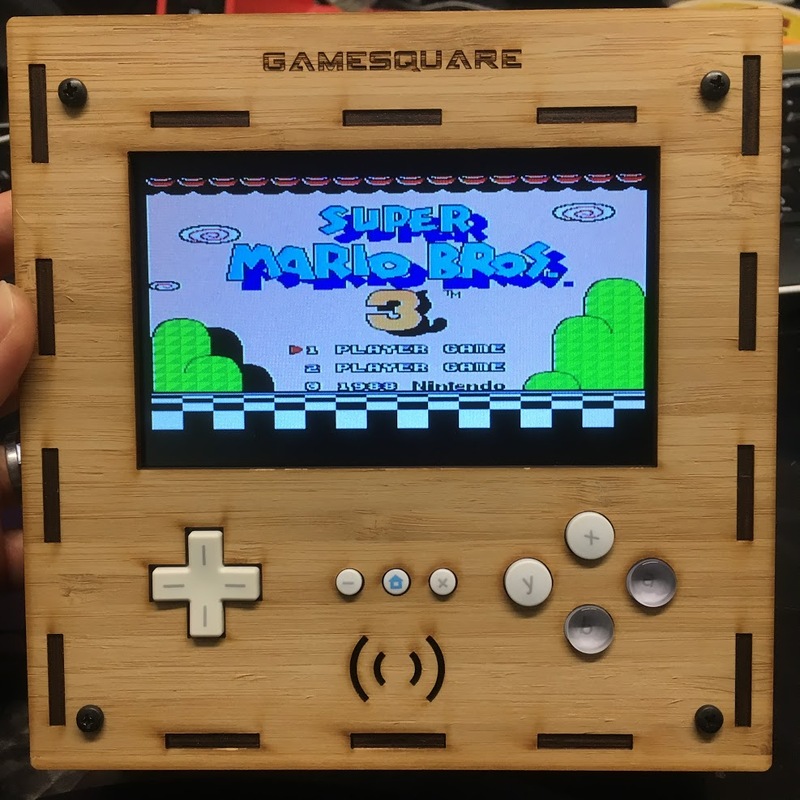 The LCD is hot-glued on the face plate. The controller buttons just sit on the PCB and are carefully wiggled into place when the face plate is fastened. Velcro holds the battery, the speaker, and the Raspberry Pi in place. I also used some Lego to hold the Raspberry Pi in place when plugging in a USB device. Hot glue and electrical tape were used as needed to fasten parts and to prevent accidental short circuits. Open the controller case with a tri-wing screwdriver, and separate the PCB with a phillips screwdriver. Desolder all the connections at J1, J2, J3, J4, ZL, and ZR. 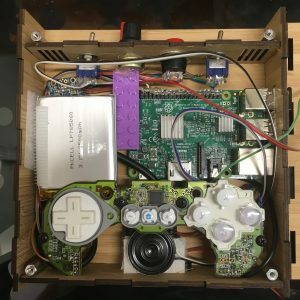 Save the main PCB and the buttons and membranes on face of the controller. I snipped off an empty corner of the PCB under J4 to make it fit in the case. In initial tests the 2500 mAh LiPo battery provides about 2 hours of play time. When the battery goes low, the LED next to the power switch turns off. The next thing that happens is the I2C bus stops working. This is problematic since system halt (without an attached keyboard) relies on buttons connected to the I2C bus. 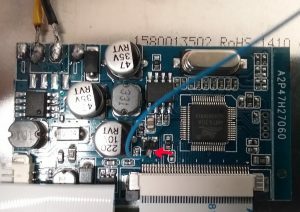 (If I can stop playing video games) I may add functionality to monitor the Powerboost 1000C LBO pin with a Raspberry Pi pin to force a system halt when it drops to ground (indicating low battery). 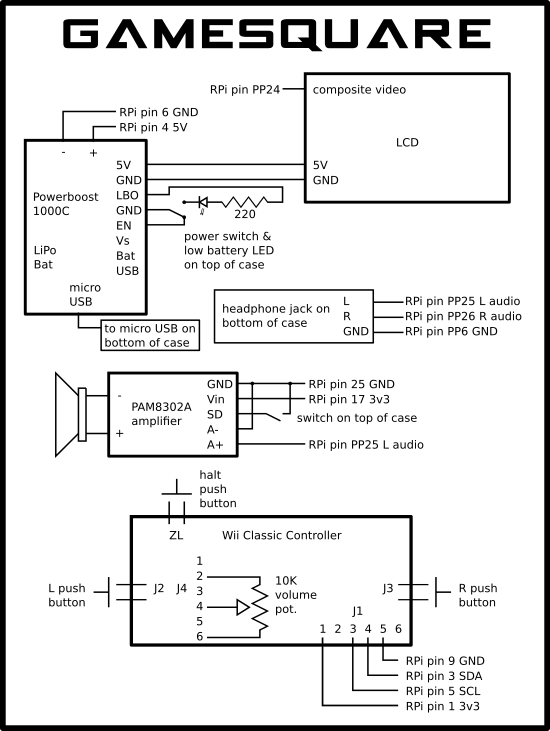 The wiring schematic shows all the relevant parts except the Raspberry Pi 3. The Raspberry Pi pins are simply labeled. This is a good reference for the forty-pin connector. The PP# pins are labeled on the underside of the PCB near the analog audio/video TRRS connector. I made all the Raspberry Pi connections by soldering to pins on the underside.